Alright lads, I think its time that we dedicate a thread to the Irish Junior team. 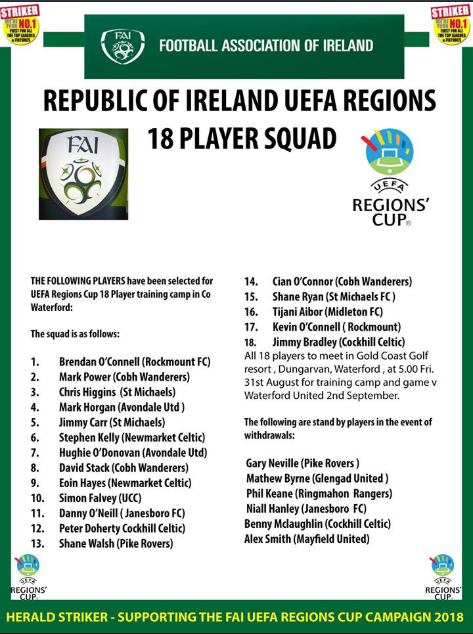 They beat Northern Ireland 2-0 up in Newry the other day and an 18-man training squad was then released for the Regions Cup. They'll play Waterford FC in a friendly on September 2nd. Munster Senior League - 9. Limerick District League - 2. Tipperary Southern & District League - 3. Clare District Soccer League - 2. Ulster Senior League - 2. Let me know if I messed up any leagues or clubs, I find it hard to keep up with Cork! Last edited by Shearer; 24/08/2018 at 4:49 PM. Regions Cup campaign in Romania concluded today with a 1-1 draw v England (North Riding) . Lost 2-1 to Buzau Region (Romania) and drew 1-1 with West Slovakia in the other group games.